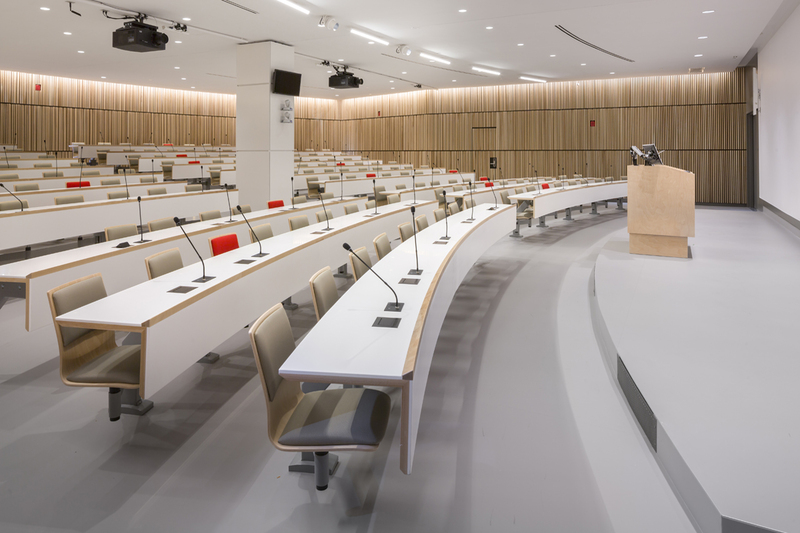 In collaboration with JLP Architects, we used our brainpower in implementing the infrastructure facilitating the integration of the cutting edge technologies in the auditorium of the new Research Institute of the CUSM (RI CUSM). 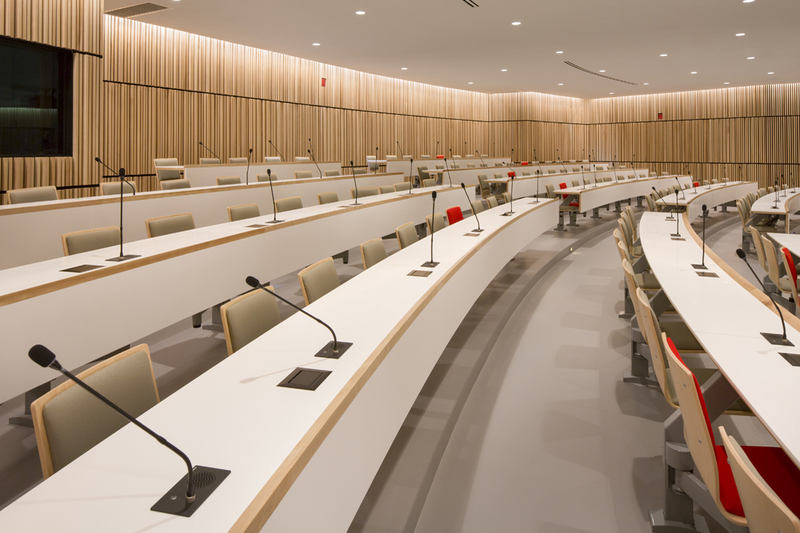 We have equipped this 195 seats auditorium with a high definition video conferencing system, a projection surface for two projectors, a hundred microphones, a discrete sound reproduction, a control system and a translation booth. Scientists, researchers, teachers and other people wearing a white lab coat can enjoy this entire technological bonanza. The disabled benefit from adapted ergonomics thanks to the lectern with adjustable height. To sum it all, we focused on the active participation of the audience during presentations. 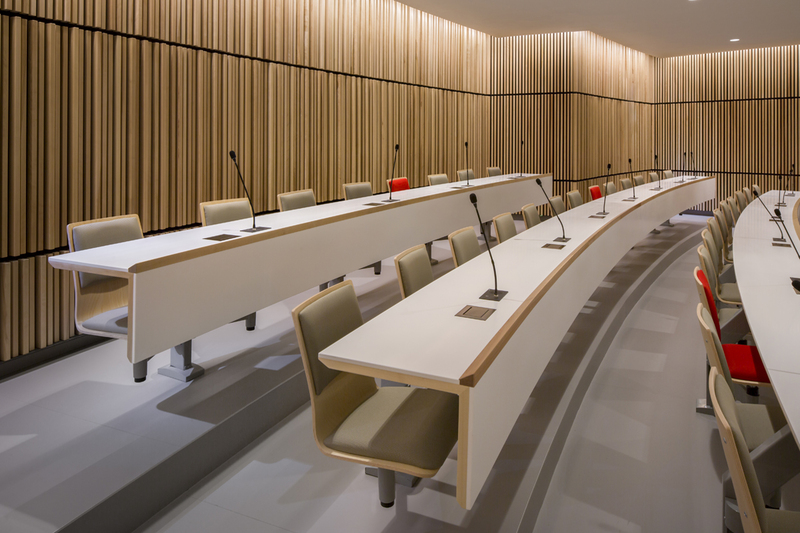 With recognized experience in designing presentation spaces, videoconferencing rooms and theaters, we managed to deal easily with the challenges that the physical constraints of the auditorium gave us. A central column that’s blocking the public viewing angles has been exploited by incorporating cameras and video monitors. Due to the low ceiling, the height of the bleachers had to be limited and the stage elevated to maintain good viewing angles. In addition to the main sound system, we have integrated additional loudspeakers to cover the upper tiers. This way we can serve the back of the room and make a pleasant sound experience to each listener.